From Sweden, DarXtar is a band that should easily appeal to fans of Hawkwind and early spacey Pink Floyd. The band consists of K.Soren Bengtsson on vocals, guitars, and keyboards, Patric Danielsson on vocals, harp, sax, and keyboards, Soren Martensson on vocals and keyboards, and Marcus Pehrsson on vocals and bass. With three members sharing the keyboard duties you can tell there's going to be a good bit of cosmic exploration. 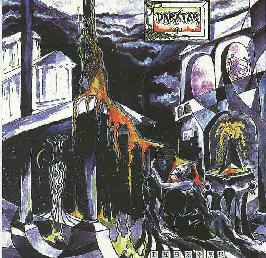 The disc opens with "Obstakel", a heavy guitar and keyboard piece that really serves as an intro to the 16 minute "7". "7" has become a personal space classic for me. Unlike a lot of good space bands who like to experiment with various sounds and effects, DarXtar is comfortable with a recognizable identity. "7" is a dreamy, Pink Floyd influenced piece that carries me away with its gorgeous keyboards and tasteful guitar licks. This disc would be worth the price for this tune alone. The last three songs on the CD features the rockin' Hawkwind influenced side of the band. "This Alien Nation" is a real rocker with an array of swirling electronics. "Eastern Wind" has a more 60's psych edge to it. And, finally, "It's Enough" is a super heavy rocker with crunching guitars and moaning vocals. If "7" eased you into a relaxed meditative state this song will make short work of that. I haven't heard any of DarXtar's other releases, but Sju should certainly appeal to fans of both the dreamy and the heavier side of space rock. But man, I do love that "7"!